Photographer Joel Meyerowitz was capturing images during the 911 Ground Zero cleanup when a fireman ran up to him with an amazing discovery. He found a remnant from a Bible which had been melted into a piece of steel shaped like a heart. The page has most of Jesus’ teaching from the Sermon on the Mount still visible. 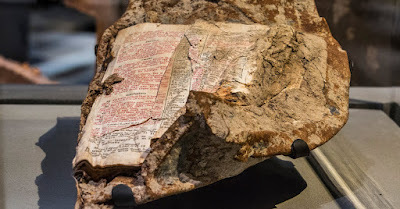 Because of the iconic nature of this discovery, Joel donated the Bible to the National September 11 Memorial and Museum in 2010. Thousands of visitors have seen this tangible reminder of God’s eternal Word. This very real picture of the enduring Word of God is a reminder that nothing will eradicate it. There is no government, terrorist, skeptic or natural disaster that can erase God’s Word. It will stand long after the sands of history have been swept away. It will endure despite the questions that arise in our hearts. Opinions and cultures will change, but the eternal truths of Scripture will not. What emphasis does God’s Word have in your life? In your family? How well do you know it’s promises and warnings? Does it sit as an untouched artifact in your home or do the pages show how it’s been called on time after time? If someone were to later find your Bible in a pile of rubble, what story would it tell? Lord, thank You for the precious gift of Your Holy Word. Thank You that You will speak to me as I read your Bible. Help me prioritize time spent in Your Word each day.